Touchdown successful! First picture received! It'll take that long for InSight to deploy and calibrate its two main science instruments, a burrowing heat probe and a suite of super-sensitive seismometers. This gear must be placed on the Martian surface by the lander's robotic arm, and InSight team members want to make sure they get this crucial step — which no other Mars robot has ever done — exactly right. InSight's arm will actually perform three such placements, because it will drop a shield over the seismometer suite to insulate the instrument from wind and temperature swings, which could interfere with data collection and interpretation. It'll take two to three months to finish the deployments, Barrett said, "and then another couple of months" before InSight's ready to begin its Mars science campaign in earnest. The additional time will be needed for the heat probe to hammer itself up to 16 feet (5 meters) below the surface, and to calibrate both instruments properly. When they're up and running, the seismometers will be on the lookout for "marsquakes" caused by internal Martian rumblings and meteorite strikes. The heat probe, meanwhile, will gauge heat flow at different depths. InSight team members will also learn about the Martian core by measuring the slight wobbles in the planet's axial tilt — data they'll gather by precisely tracking InSight's position over time. Together, these observations will reveal a great deal about Mars' internal structure and composition, which in turn will shed considerable light on how rocky planets in general form and evolve, mission team members have said. 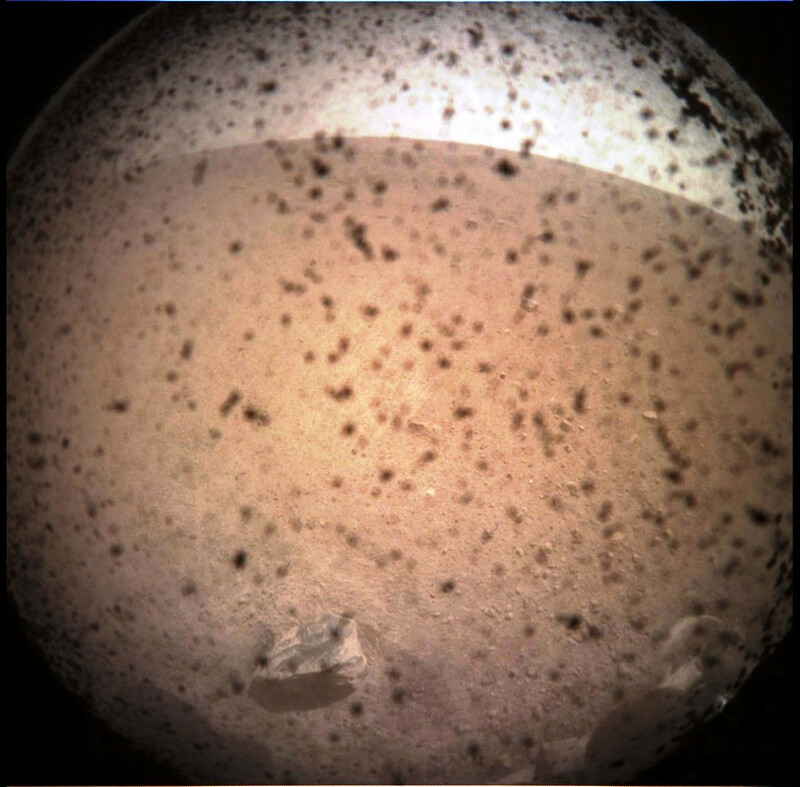 InSight has already beamed home a bit of information, including a dust-speckled photo of its immediate surroundings. And this little taste — the stationary lander's first image from Mars — bodes well for future data collection, Barrett and other team members said: The area appears to be relatively flat and sandy, without lots of big rocks or other impediments to deployment. "We were all certain that that first image would help us determine how difficult a job we would have in placing the instruments," Barrett said. "And I'm very happy that it looks like we'll be able to do it quite easily — we hope." 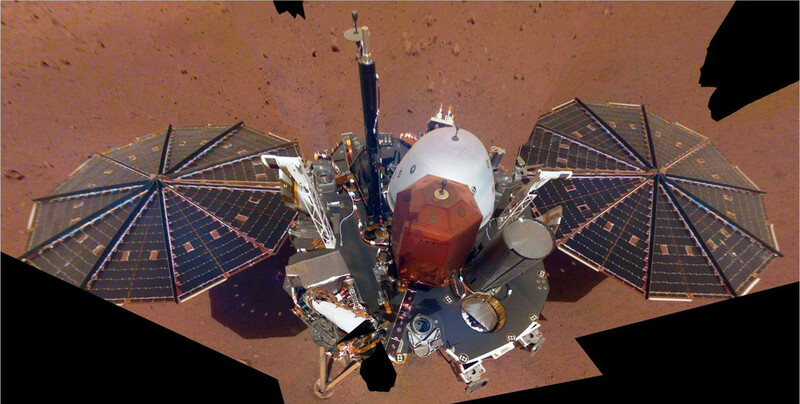 "InSight" is short for "Interior Exploration using Seismic Investigations, Geodesy and Heat Transport." The lander's surface mission is scheduled to run for one Mars year, which is nearly two Earth years. It'll probably take the lander about that long to gather enough data to address its main mission goals, team members have said. Mike Wall's book about the search for alien life, "Out There" (Grand Central Publishing, 2018; illustrated by Karl Tate) is out now. The steady stream of photographs and data from Opportunity — as well as its twin, Spirit, which survived until 2010 — also brought Mars closer to people on Earth. Because the rovers continued so much longer than expected, NASA has now had a continuous robotic presence on Mars for much of this century. 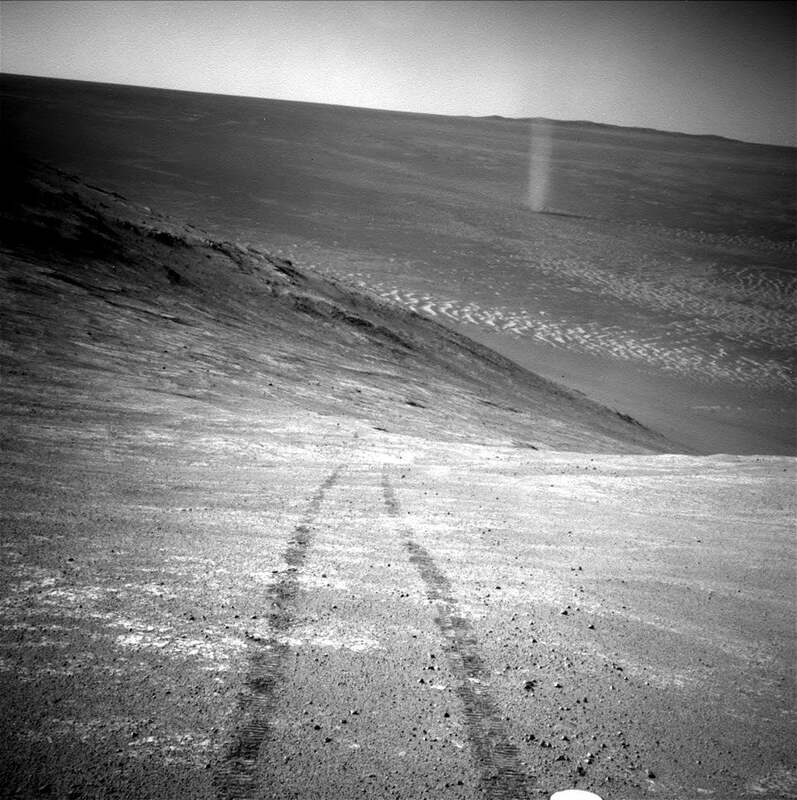 NASA's Mars rover Opportunity reveals its shadow, seen on July 26, 2004, and snapped by the rover’s front hazard-avoidance camera. At the time, Opportunity was moving farther into Endurance Crater in the Meridiani Planum region of Mars. 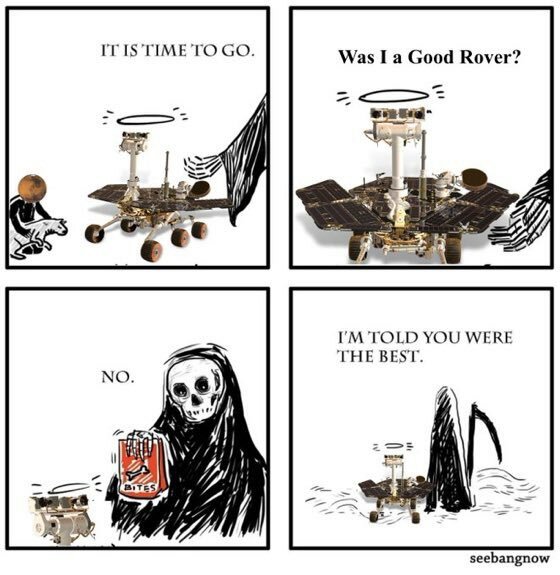 NASA's Opportunity Rover has died on Mars. 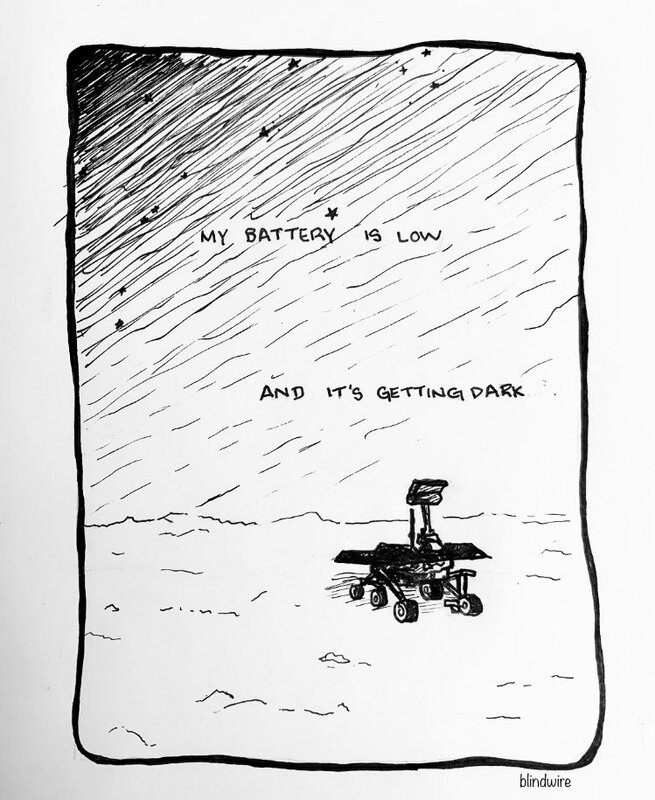 The little solar-paneled robot apparently ran out of battery power during the Red Planet's awesome 2018 dust storm, and after one last attempt to contact it, NASA concluded yesterday (Feb. 13) that the far-off explorer is no more. Many human artifacts wouldn't last very long beyond our protective biosphere. As Live Science reported previously, solar radiation has likely shredded the Tesla Roadster Elon Musk launched into space last year. Jeff Moersch, a professor of planetary science at the University of Tennessee, Knoxville, and a member of the Opportunity team, cautioned that he's not an expert in the rover's engineering. But he said that Opportunity does have some plastic bits that might eventually break down under the glare of the sun — its insulation, for example. "But, by and large, I think it'll look pretty much as we left it," when and if astronauts ever do come across its resting place, Moersch told Live Science. It'll probably be pretty dusty, though, he added. That's assuming that astronauts do make it to Mars in the relatively near future — the next century or two, for example. Over much longer periods, Moersch said, dust will settle on the rover. Opportunity functioned as long as it did because regular Martian winds tended to routinely blow dust off its body. But over longer periods, it's a bit of an open question whether the dust or the wind will win out. What about millions of years in the future? 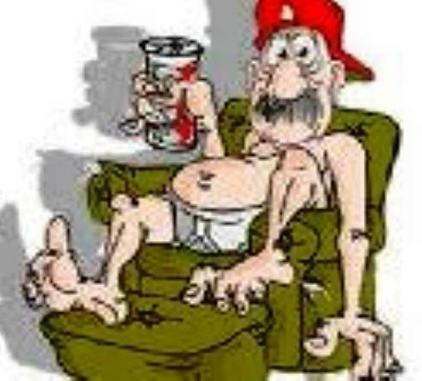 On Earth, anything old and dead and sitting in one place on the surface tends to eventually end up underground. But that's thanks to the effects of water and plate tectonics, Moersch said — factors that aren't present in the same way on Mars. "Over the very long-term, you're going to get impacts that knock up ejecta [airborne Mars dirt] from where they hit, and that ejecta will very gradually resurface [on] the planet and bury things that were on the surface," he said. That said, Moersch added, when humans do settle Mars, it's not unreasonable to imagine they might make some effort to recover and preserve Opportunity. Perhaps it could end up in museum, or the region explored by the rover might end up as a national park. Of course, if humans never get there, Opportunity might not make it into the fossil record at all. It's at least plausible that, given millions of years, a meteor could strike it directly and smash it to bits. 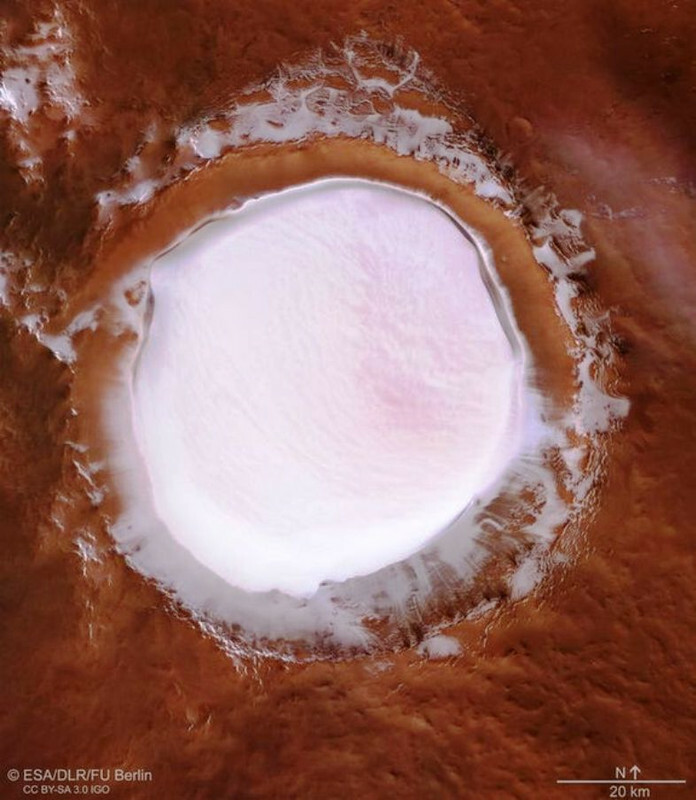 Mars: a red planet covered in pareidolia. 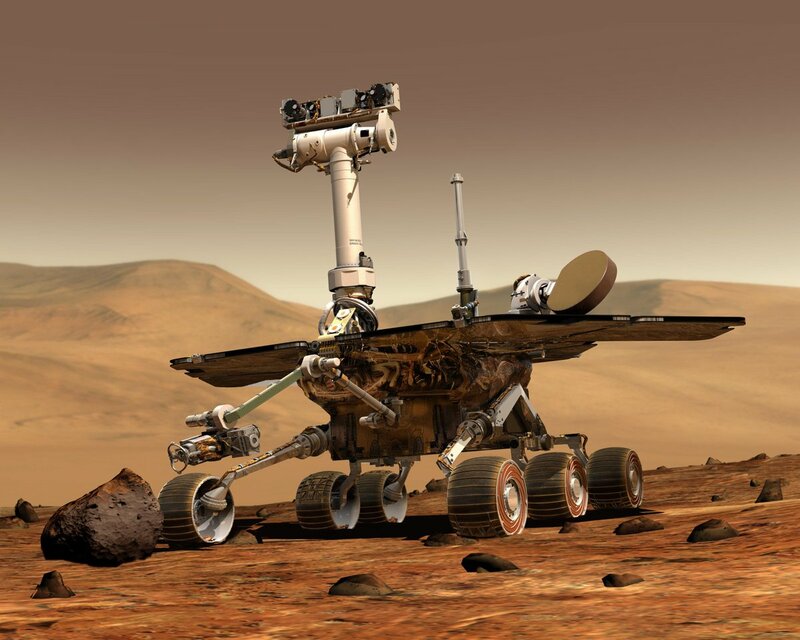 The Opportunity Mars rover may be dead, but the phenomena it helped propagate is alive and well and continuing to cause odd news stories about creatures, humanoids and strange out-of-place objects on the surface of the fourth rock from the Sun. The latest can be seen in a photograph making the usual romp across the paranormal and weird news side of the Internet showing what appears to be a piece of metal with a perfectly round hole cut into it lying on the surface of Mars as if it: a) fell off of an alien spaceship; b) was left by humans who secretly visited the planet; c) is part of an abandoned alien city slowly rising up as the soil is blown away. Or it could be a rock. 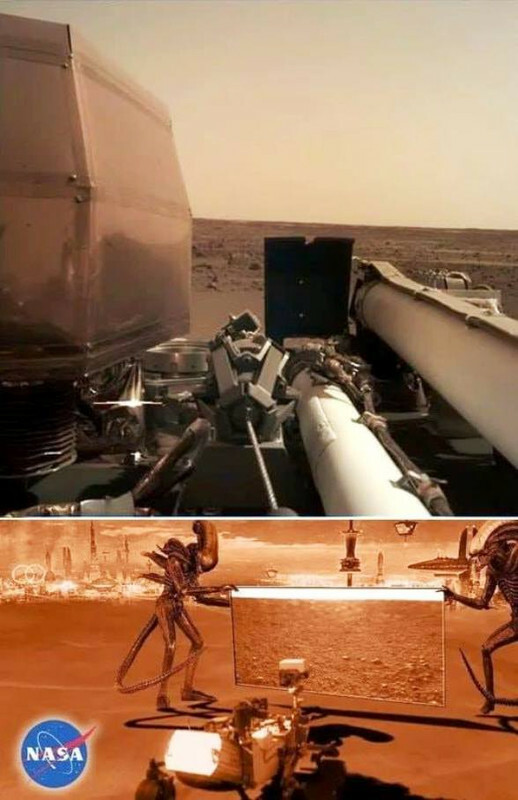 The photo was the star of a video uploaded this week on the WhatsUpInTheSky37 YouTube channel, which attributes it to a “Shamus” who apparently found it at a really cool site called Gigapan for SOL 2013 which shows paannamic views of the Martian surface that can be moved and zoomed. All of that could be more impressive than the object itself, which indeed looks like a triangular piece of metal with a perfect circle cut out that skeptics know from looking at other pareidolia-fied photos from Mars and the Moon could very well be a rock whose image is distorted by shadows and angles. On the “piece of a human Martian probe” side, commenters point out that it could be debris from the lander that brought Curiosity to Mars or it could have fallen to the surface from another successful or failed Mars mission. Adding a little imagination, it could be a piece of a spaceship or vehicle or other equipment from a secret mission – you know, the NASA missions to land humans on Mars that no one can talk about. 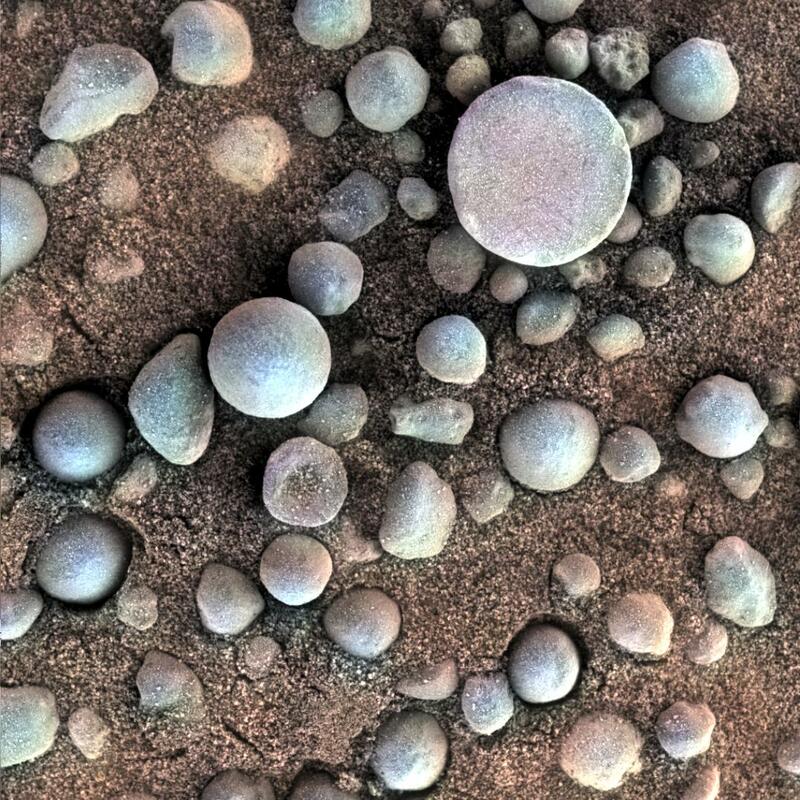 There are no tire tracks or footprints around the piece, but those could easily have been blown away by the strong Martian winds, although they somehow didn’t cover up or pile sand against the object, which seems to be resting unobstructed on the Martian ground. 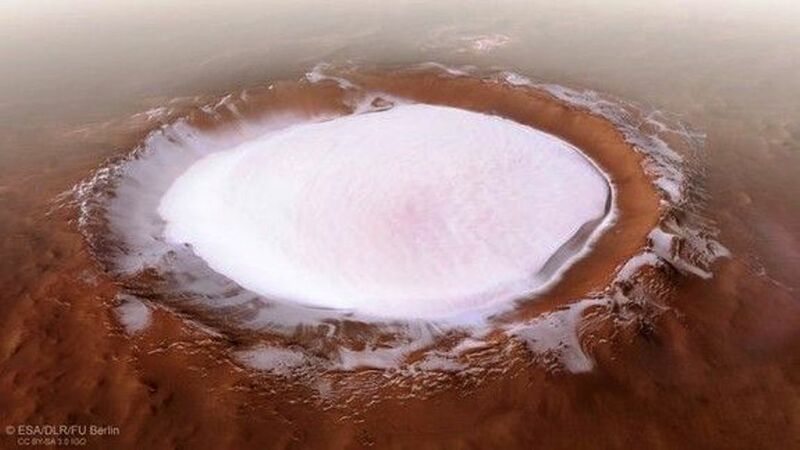 Going full pareidolia-plus-enhanced-imagination, commenters speculate it could be from an alien spacecraft – assuming their spacecraft crash or fall apart like ours do, even after successfully navigating accident-free for light years. Again, that paannamic view from Gigapan shows no other objects in the immediate area. Yes, that’s the case with many fossils found on Earth, but those are tissue that can deteriorate, decay and disintegrate … this is allegedly a piece of metal that survived a trip of light years. In the end, unless a rover with an arm, a robot with an arm or a human astronaut with an arm can pick up the object, inspect it closely or bring it back to Earth, we’re unarmed to do more than just speculate what this thing might be. For now, the needle on the meter is very close to ‘rock’. Pareidolia … you’re a cruel friend. As “neat” as all this sounds, “faux” grapes is one of the foods I have come to question in the last 2 years. You know, those large, exceedingly plump green ones that look too good to be true? The couple of times that I found one later, spilled next to the driveway, were UNTOUCHED by insects. And unspoiled a few days later. Even ones halved. Kind of reminds me of ice cream that doesn’t melt.